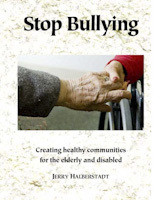 A Bill Protecting Elderly Persons and Persons With Disability From Bullying, Mobbing, and Hostile Environment Harassment in Multifamily Subsidized and Public Housing. This bill establishes the Tenant Protective Services Agency to investigate complaints about bullying of tenants who are elderly or persons with disability, to provide protection to targets of bullying, and to refer situations of hostile environment harassment or institutional mobbing to the Attorney General or District Attorney for civil action against the landlord to protect the rights of residents, including the right of peaceful enjoyment. The Commission on Bullying, on which I served, was able to do significant new research. One topic emerged to be of great importance---mobbing. Where the landlord does not act against bullying to protect the right of all tenants to peaceful enjoyment, it is mobbing, and in such circumstances, I see no effective way to prevent the bullying. The established right of tenants to have peaceful enjoyment is diminished by mobbing and bullying. In contrast, our research also found that many landlords work with their tenants as well as their managers and staff to assure the rights of tenants and oversee peaceful, healthy communities. It can be done! Only if tenants are protected from bullying and retaliation can people live a healthy and peaceful community life. Today, alas, there is no way for tenants to reliably obtain relief and justice. Therefore, the minority Commission report and this legislation focus on creating the capability for investigation, protection, and holding the landlord responsible. I depend on you and your colleagues to advise and help us develop effective legislation. We stand ready to work together with you and your colleagues to enable the Commonwealth to improve the lives of all who live or work in public or subsidized housing.